Discovery tasks can be tracked along three phases, Plan, Run, and Analyze. When you're finished adding data and recording your results, you can complete your test by clicking Complete at the top of the Research or Experiment screen. Once a test is completed, it cannot be edited. This is to ensure the integrity of the results and information gathered there and allow it to remain intact in light of new learnings and data. 1. To Complete your Research or Experiment, click Complete when you've finished the final phase, Analyze. 2. Confirm that you wish to complete this test. This Research or Experiment will no longer be editable, and will have moved from the Active section of the Discovery tab to the Completed section. 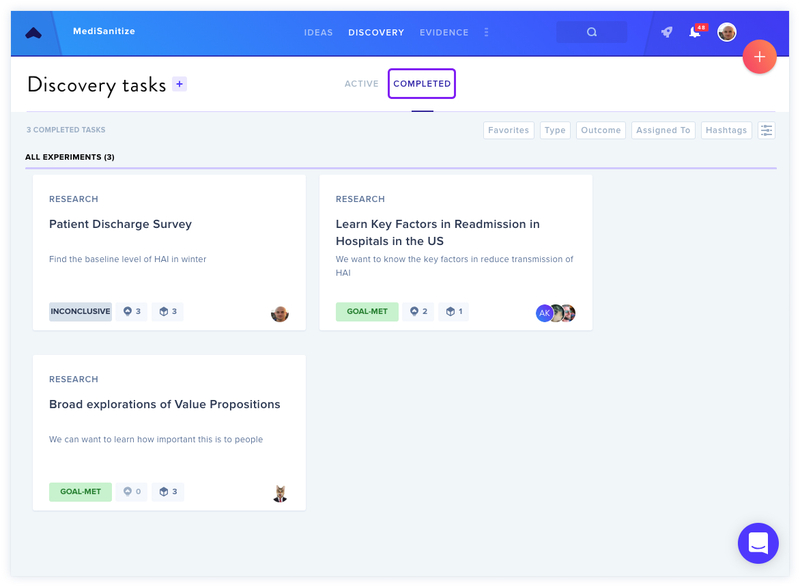 Click here to find more about Discovery tasks.